Applications are invited for walk in interview against the following contractual positions in Project Management Unit (PMU), Guwahati, Project Implementation Unit (PIU), Guwahati & Dibrugarh of Assam Urban Infrastructure Investment Program sponsored by ADB for an initial period of 11 months (extendable). 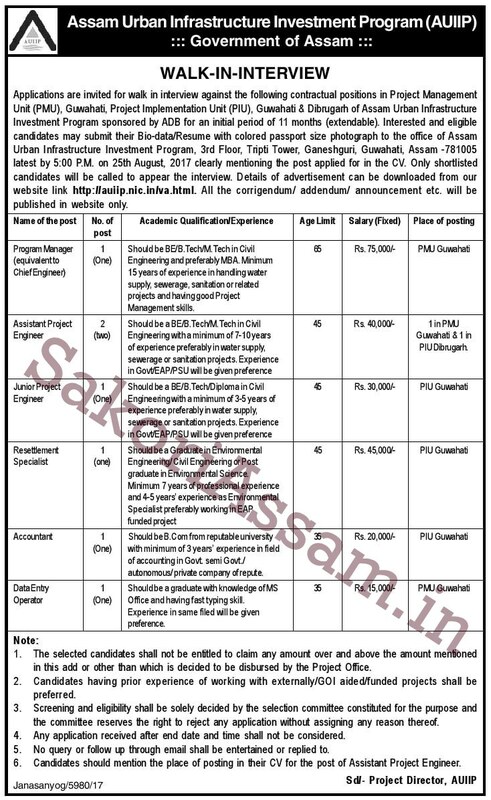 Interested and eligible candidates may submit their Bio-data/ Resume with colored passport size photograph to the office of Assam Urban Infrastructure Investment Program, 3rd Floor, Tripti Tower, Ganeshguri, Guwahati, Assam-781005 latest by 5:00 PM on 25th August, 2017 clearly mentioning the post applied for the CV. Only shortlisted candidates will be called to appear the interview. Details of advertisement can be downloaded from the website link http://auiip.nic.in/va.html. All the corrigendum/ addendum/ announcement etc. will be published in website only. Qualification/ Experience: Should be BE/ B.Tech/ M.Tech in Civil Engineering and preferably MBA. Minimum 15 years of experience in handling water supply, sewerage, sanitation or related projects and having good Project Management skills. Qualification/ Experience: Should be a BE/ B.Tech/ M.Tech in Civil Engineering with a minimum of 7-10 years of experience preferably in water supply, sewerage or sanitation projects. Experience in Govt/ EAP/PSU will be given preference. Place of Posting: 1 in PMJ Guwahati & 1 in PIU Digrubarh. Qualification/Experience: Should be a BE/ B.Tech/ Diploma in Civil Engineering with a minimum of 4-5 years of experience preferably in water supply, sewerage or sanitation projects. Experience in Govt/ EAP/ PSU will be given preference. Place of Posting: PIU Guwahati. Qualification/ Experience: Should be a Graduate in Environmental Engineering/ Civil Engineering or Post Graduate in Environmental Science. Minimum 7 years of professional experience and 4-5 years experience as Environmental Specialist preferably working in EAP funded project. Qualification/Experience: Should be B.Com from reputable university with minimum of 3 years experience in field of accounting in govt. semi Govt./ autonomous/ private company of repute. Qualification/Experience: Should be a graduate with knowledge of MS Office and having fast typing skill. The selected candidates shall not be entitled to claim any amount over and about the amount mentioned in this add or other than which is decided to be disbursed by the Project Office. Candidates having prior experience of working with externally/ GOI aided/ funded projects shall be preferred. Screening and eligibility shall be solely decided by the selection committee constituted for the purpose and the committee reserves the right to reject any application without assigning any reason thereof. Any application received after end date and time shall not be considered. NO query or follow up through email shall be entertained or replied to. Candidates should mention the place of posting in their CV for the post of Assistant Project Engineer.